A decision to promote Czech classical music abroad is not an easy one: boosting the specific musical tradition amongst myriad of national or foreign authors, and facing not only artistic but also business competition. If such decision is made by a woman, who persists for quarter of century, it makes such efforts twice as commendable. Anita Smíšek, president, administrative director and publisher of Alliance Publications, Inc. with Czech roots and rich spiritual background (dominican nun) kindly answered our questions, drawing the big picture of 25 years long, unflagging and successful efforts of those, who believe in universal message in music. What musical background do you have? Any influences, teachers, associations, records? I grew up in a rural Czech farming community with a mother who played the piano and sang as she worked and a father who loved to hear it. She grew up singing alongside her father at the piano and was in the church choir and sang in Czech plays in her youth. My parents purchased a fine piano for the family providing piano lessons for the four of us children. Favorites memories of mine recall the scene of the four of us siblings learning to sing together while mother accompanied us on the piano. A precious adulthood memory is that of learning and performing the “Moravian Duets” of Antonín Dvořák with my mother for several benefit concerts along with other Czech folksongs wearing our homemade “kroj“. How deep your Czech roots go? I am a third generation American Bohemian Czech. All four of my great-grandparents came from South Bohemia as young couples to Minnesota (the Big Woods area–New Prague) in 1867 seeking farmland on which to raise their families. Since 1987 when I made my first visit to then Czechoslovakia, I have returned many times to experience life, meet people and renew friendships made, collect music, attend concerts and walk the ancestral villages from which my people came. These visits have nurtured the heritage of music that is deep within my soul. I grew up hearing Czech spoken by all my relatives and townspeople but was not taught to speak it. As an adult, I took a quick Czech language class to learn to pronounce it correctly so I could sing it well. George Snajd, an emigrant-teacher, taught me well and corrected all my manuscripts for publication. I love learning and have a healthy respect for the scholarship I observed in old Czech publications. How is it that you began researching Czech music? My graduate school professor at the University of Minnesota, an eminent musicologist who emigrated from Germany, advised me in 1967 to choose to write on a musical topic from my Czech heritage. His advice launched me on a never-ending quest resulting in the establishment of Alliance Publications, Inc. twenty-two years later. I researched and published a collection of 19 Czech Christmas Carols” that were being sung in many Czech churches in the USA…a recording followed…and then a search for understanding the spirit of each liturgical season as was evident in the Czech hymns. Fifteen years later, I was able to publish “Give Glory” – a hymnal of 78 hymns for all seasons with new English words to the Czech tunes. I taught them all to my church choir first in Czech at St. Wenceslaus Church in New Prague, MN and then in English. Neighboring churches in Veseli, Lonsdale and Montgomery, MN also used them. My search then focused on learning folk songs from all areas of the country which was a total delight. I ended up giving performances and presentations at the Czech and Slovak Genealogy Conference on many occasions and have published and recorded 3 sing-along collections. Why did you start a publishing house and with such specific focus? While I served the Church of St. Wenceslaus as music director-organist, I was became the Artistic Director of the Nová Praha Vánoční Koncert which utilized my church choirs as well as were augmented by many other amateur and professional musicians. The music I had collected the previous twenty years suddenly had a venue. The 18th c. pastorales of Línek, Ryba, and Sehling plus the Česká mše came to life again in the USA. I hired a professional composer-arranger, Joel Blahnik, from Fish Creek, Wisconsin to assist me in providing good arrangements of for the next year. The partnership became so successful that we dreamed of publishing the music we had been performed. The rest is history. Our passion for bringing the music of our common Czech heritage fueled a mission to publish this treasure store of music which simply had never been published in the US before and so was totally unfamiliar to people. It was time to share it and we were willing to become a team to make it happen. Music of the old Czech masters and that of Antonín Dvořák became our first publications along with our arrangements of the Czech hymnody. The encouragement of composer, Václav Nelhýbel, who became a mutual friend, was most affirming. He composed a series of organ preludes based on many of these tunes for our catalog. My sense of industry, love of learning, the advent of desk-top publishing and the Finale music notation software all converged to make it possible to birth a new entity in July of 1989, Alliance Publications, Inc.
Tell us about the founding of API 25 years ago, and what was its focus? Alliance Publications, Inc. began as a desk-top music publishing ministry in 1989 by me (Anita Smisek, OP) and Joel Blahnik, drawn together by our (their) common Czech heritage and interest in promoting music of their ancestral country. 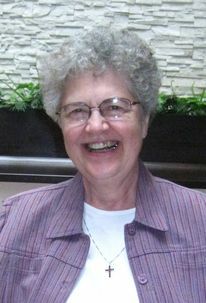 Anita has served as its president, executive administrator and publisher for API now in its 25th year. As educators, we were interested in promoting quality music for school, church, and community ensembles. Therefore, the catalog of API music is broad—band, orchestra, choir, as well as music for piano, organ, voice plus solo/ensemble music for all instruments. The unique specialty of this publishing house is Czech and Slovak music because it enables API to make this music available to the USA as well as world market and gives composers from other countries an opportunity of being published outside of their own country. Since 1992, the company has its home at Sinsinawa, WI, the Dominican Motherhouse and has been able to have space to grow and reach out to many musicians. How has the company grown since its beginnings in 1989? 1 from Israel, Romania, Canada, Philippines, Italy, and the Republic of Georgia. Disregarding contracted composers, because API publishes arrangements or updated scores of composers from previous centuries, the catalog contains music of 147 Czech or Slovak composers living in CZ, USA England or Sweden. See the list of names below. How successful are Czech composers in USA? From API’s history of sales of choral music alone, the music of Czech composers has been very successful. Of all choral titles, 8 of the top 15 best sellers are by Czech composers—Dvořák, Mácha, Krček, Lukáš, Hroněk. Of the SSAA choral titles, 8 of the top 12 best selling titles are by Czech composers—Mácha, Lukáš, Uherek, Eben, Smetana, and Raichl. Do you see any difference between Czech and American composers and their works? There is a difference because they express themselves out of a different heritage and lifestyle. They are extremely well skilled and disciplined in their writing, choose interesting texts and offer fresh sounds, harmonies and rhythms reflecting the vast array of folk sources within the country. What is your relationship with contemporary classical music, do you publish any, why or why not? It is important to be publishing good contemporary classical music to keep encouraging musicians and audiences to broaden their repertoires and adapt their ears to new combinations of sound. One must be discriminating about this and try to discern what the market might be able to take, what the company can gamble on producing, and what is important to put out there even if it may not sell well at the present if it is an excellent work. What does your average customer look like? Our customers are band, orchestra and choir directors from schools of every level – grade school, high school, college and university; church choir directors, some professional musicians, as well as community music ensemble directors of professional or amateur choirs, bands or orchestras. Many of our titles have been selected to be on State Music Festival Lists from which teachers select quality music for their students’ solo and ensemble events. Any plans for future? Expansion or transition to digital media? Future plans to sell digital downloads may happen, but for now, we prefer to sell printed sheet music. Our sub-publisher in Prague is Talacko Sheet Music and we look forward to their having more titles prepared for sale from our catalog for sale on the European continent. API wants to continue to being a musical bridge to the world making Czech music available to more musicians beyond our borders. To introduce music of Czech composers to young students, API inaugurated a “Music Distribution to Schools” project for which the Czech Embassy granted financial support. For two years, selected bands, orchestras and choirs received API music from Czech composers they had never before been introduced to. Hopefully, we can continue such promotions in the future. We aim to continue to support, encourage and publish the more works of women composers (we now have 59 women in our catalog) as well as promote contemporary music and young composers. Modern technology is constantly challenging us as did building a new website launched in August of 2014. There is continual updating to do and promotion through a variety of avenues, including social media. I am working to update all music files of Czech composers to provide .pdf files for study and research for the Music Information Center Database. API is a small, non-profit educational music publishing desk-top company operating out of Sinsinawa Mound Center at the Dominican Sisters’ Motherhouse in Wisconsin. We do a big work in a concentrated space for a wonderful purpose—the love of great music. My partner, Joel Blahnik functions as editor and arranger and proofs articulations for instrumental scores at his home in Fish Creek, WI. Between the e-mail, phone and regular mail, we are able to do our work quite efficiently. At other times, he comes to Sinsinawa where we can work side by side finalizing scores. I do have several part-time volunteers who do a variety of important tasks on a daily basis to keep the stock room and inventory in good condition, and prepare materials for exhibits. I try to attend several state conventions each year at which I exhibit and offer publications for sale. E-mail has been a great time-saver for proofing scores between composers and API. How compatible is your your spiritual life as a nun with “tough” publishing business? Perceptive question! I belong to a congregation of religious women within the Dominican Order actively engaged with people to bring about a better world in truth, justice and love. Study is an important means to equip ourselves to relate meaningfully with others through education and so I became a teacher and have functioned in classrooms, choir lofts and now as a music publisher. I cherish the relationship I have been able to make with living composers in many countries. Accepting a creative work of theirs to be published becomes a sacred act of trust and affirmation is a very touching experience for me to know it means so much to them to accept their work. Many a “resurrection” experience has happened to them. I’ve received letters of gratitude telling me how they have been motivated to keep on writing and working as a result of their music being acknowledged, affirmed and accepted for publication. To accomplish all this, yes, we have had to become a legal corporation within the laws of our state as a non-profit educational organization, work hard to pay our bills, and justly reward royalty to composers on an annual basis, but the driving force behind the company is music and the pride we have in our Czech musical heritage, not money. It is a legacy to share, not one to keep undercover. Hopefully sales will continue and become greater, but our energy comes from the people we work for, those we hope will perform the music and the composers who create it. Music is a language of the human soul given by our Creator enabling humankind to bring about many expressions. I myself join my community daily for sung morning and evening prayer and could not live without the language and gift of music. It feeds my spiritual life. I know that all the music we publish has the potential to do the same for its performers and listeners alike.